Need a quick and easy veggie appetizer idea? 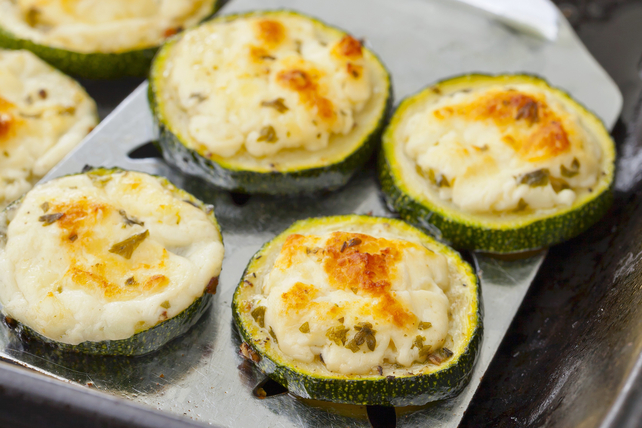 Then, you should try our Pesto & Feta Zucchini Rounds. These tasty, yet easy-to-make, morsels are sure to win kudos from vegetarians and meat eaters alike! And these smart appetizers are the perfect way to use that zucchini when it's in peak season. Place zucchini in single layer on baking sheet sprayed with cooking spray. Broil, 6 inches from heat, 5 min. Meanwhile, combine remaining ingredients. Turn zucchini; top with cheese mixture, adding about 1 tsp. cheese mixture to each zucchini slice. Broil 2 to 3 min. or until lightly browned. Prepare using Classico Pesto di Sardegna Sun-Dried Tomato. For added flair, sprinkle lightly with chopped fresh basil before serving.